2 km further away from Kokkari and just after Lemonakia. 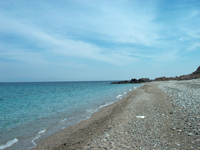 Beach with pebbles and identical to that of Lemonakia.12 km from Samos. Clean beach with clear, cool waters. It has a restaurant, tavern and hotel. 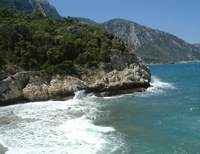 17 km from Samos. Long wide beach with stone stretching all the way to Kambos Vourliton. 23 km from Samos. 2 km outside of Karlovassi. An open beach covered with pebbles. It has a restaurant, cafeteria and rooms to let. 37 km from Samos. A very large in area sandy beach. The waters are very clear. There is a restaurant, cafeteria, and rooms to let. 55 km from samos. Two unimaginable beautiful beaches not so well known. They can be reached only by foot and are sited after Karlovassi.